CHASING FOOD DREAMS: Ee Chinese Cuisine, Eastin Hotel Petaling Jaya: A Luxurious Mid-Autumn Festival Celebration Set Meal! Ee Chinese Cuisine, Eastin Hotel Petaling Jaya: A Luxurious Mid-Autumn Festival Celebration Set Meal! Dine like Royalty at Ee Chinese Cuisine this Mid-Autumn Festival Season! It is not only the season to indulge in mooncakes but rather a time for gatherings of family and friends. At Eastin Hotel Petaling Jaya, Ee Chinese Cuisine is proud to present their Mid-Autumn Festival Celebration Set Meal, a sumptuous 6-course dinner menu with Master Chef Yong Kam Wah’s signature dishes. Pamper yourselves with luxurious Chinese cuisine together with your loved ones for a meal so fine, you’ll feel like royalty! Eastin Hotel Petaling Jaya is proud to present their new Executive Chef Alex Leong. Chef Alex brings with him an exquisite background of refine Chinese cuisine and is responsible for overseeing the restaurants at the hotel. Ee Chinese Cuisine is a premier dining restaurant offering authentic Cantonese a la carte and dim sum, serving non-halal cuisines. With an astonishing seven private dining rooms, it is an ideal place for business entertainment or pure family and friends gatherings. Expect signature dishes such as Peking Duck, Suckling Pig and Seasonal seafood prepared in refine Chinese style with a modern touch. Starting off the opulent set meal is a teaser of small bites in Eastin Deluxe Three Combination. Going plush all the way, the three appetizers of Steamed Egg Custard with Foie Gras, Bacon Roll and Phyllo with Seafood make an ideal combination of flavors and textures. It may be Chinese cuisine but presentation takes form from the Western influence. Served in champagne glass, Steamed Egg Custard with Foie Gras is a savory custard glorified with precious pan-seared goose liver. Sumptuously delicate and graceful in flavors, the silky soft egg custard matched really well with the rich and creamy liver. Morsels of brown Shimeji mushrooms and bits of greens compliment in textures. The dish makes one crave for a repeat! If you asked me what could mend a broken heart, I’d tell you Bacon!! Bacon seemed to make every dish better. The second bite of the course showed off bacon beautifully in Bacon Roll. Crisp bacon wrapped around fish paste and coated in sweet and sour sauce is one heavenly bite. I could certainly do with a few of these for extra coddling. Phyllo with Seafood summed up the first course with charm. Shredded finely, the ultra-thin phyllo held a filling of sweet seafood paste and topped off with creamy salad dressing and little globules of tobiko. Crispy outside, tender inside, biting into this was just pure pleasure! Having visited Ee Chinese Cuisine before, I concurred that Chef Wong truly takes the trophy in making opulent soups fit for royalty. Sparing no expense in ingredients, soups at the restaurant are laden with intense flavors of superiority. A moment of déjà vu while savoring Double Boiled Shark’s Bone Soup with Fish Maw and Superior Shark’s Fin was indeed much welcome. Boiled for hours, the shark’s bone expelled copious amounts of collagen, making the soup milky white and filled with sticky sensations of undeniable protein. The broth was so lavish, I would have been satisfied with just the gastro opulence it exuded. However, Chef Wong brought up another notch by adding posh ingredients like fresh fish maw and superior shark’s fin to the already luscious broth. Intense oceanic flavors detected in the hot piping broth. During this course, there was utter silence in the room with only whispers of happy sighing… a truly extravagant soup indeed!! Luxury doesn’t stop here, we continued on to savor one of the finest hog in the form of Pan Fried Kurobuta with Shimeji Mushrooms and Vegetable. Kurobuta or Berkshire pigs, a rare breed of black pigs, are renowned for juicy, well-marbled and tender meat. The pork is beautifully marinated in a sweet and savory sauce. Pan seared to achieve a slight crisp outside and gorgeously tender meat, one can definitely taste the richness of the fats. Sides of sautéed Shimeji mushrooms and crunchy broccoli balanced up the richness of the pork. If you like a good kick of bold and spicy flavors, asked for this green chili sauce made-in-house! For another seafood course, we were treated to Steamed Marble Goby with Fresh Beancurd in Superior Soy Sauce. When the ingredients are fresh, one only needs a simple method to turn it into a star. Plus points for the fresh beancurd sheet as it accompanied the delicate fish with a natural sweetness. Simple and showcased the delectable piece of fish beautifully! An ingenious creation combining certain dishes resulted in Steamed Soba with Prawn and Egg White! Slurp up light thin smooth soba embedded in soft egg white custard with tinges of crustacean sweetness . Plus points go to the refine flavors derived from the sweet prawns and creativity of the dish. To add further pampering this festive season, a complimentary box of freshly baked mooncakes will be presented to every four diners from 16 August to September 2012. 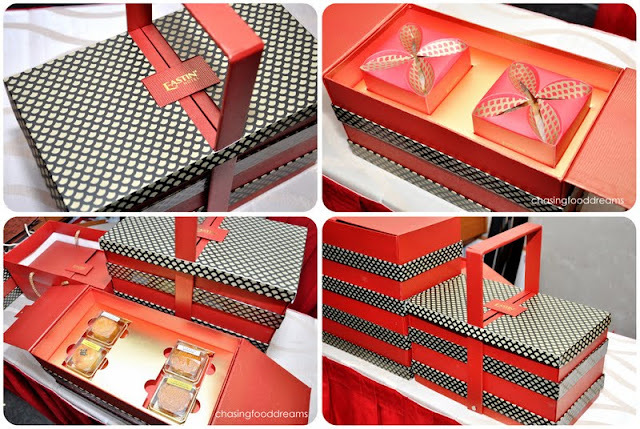 Check out the Mooncake offerings available at Eastin Hotel Petaling Jaya that comes in an exquisitely crafted two-layered gift box in bold red, black and white. A series of delectable baked and snow skin mini mooncakes from the Ee kitchen are available now. Savor traditional Baked Assorted Fruits & Nuts with Chicken Bits, White Lotus Paste with Single Yolk and Crispy Salted Egg Yolk Puff to modern Golden Honey Grapefruit with Pineapple and Black Sesame Lotus. Mini Snow Skin Series offers Crystal Bamboo Charcoal Paste, Green Tea with Single Yolk, Walnut Chocolate and Durian Duo. A much welcome returned at Ee Chinese Cuisine only enhanced the beautiful experience. The restaurant is indeed a truly hidden gem as the dishes offered are luscious and prepared with much thoughts by Chef Yong and his kitchen team. Dim sum is also another offering and the weekend dim sum All-You-Can Eat Dim Sum promotion is one fabulous dim sum to check out. Read about my dim sum brunch here. The Mid –Autumn Festival Celebration Set Meal is individually served and priced at RM168++ per person (minimum 2 person). In addition, a complimentary box of freshly baked mooncakes will be presented to every four diners from 16 August to September 2012. Kindly call Ee Chinese Cuisine at +603 7628 7338 for further enquiries. The deluxe three combination looks worthy of a number of orders. I love how the mooncakes were presented. Looks like drawing.